"United States Census, 1900," database with images, FamilySearch (https://familysearch.org/ark:/61903/1:1:MS69-WRT : accessed 16 December 2016), Edward Mckinlay, Albany city Ward 16, Albany, New York, United States; citing enumeration district (ED) 55, sheet 10A, family 222, NARA microfilm publication T623 (Washington, D.C.: National Archives and Records Administration, 1972. ); FHL microfilm 1,241,005. New York State Census, 1905, database with images, FamilySearch (https://familysearch.org/ark:/61903/1:1:SPDV-V78 : 26 November 2014), Edward Mckinley, Albany, Ward 16, E.D. 01, Albany, New York; citing p. 13, line 6, county offices, New York. ; FHL microfilm 521,947. "United States Passport Applications, 1795-1925," database with images, FamilySearch (https://familysearch.org/ark:/61903/1:1:QV5Y-TLS8 : 4 September 2015), Florence Mc Kinlay, 1921; citing Passport Application, New York, United States, source certificate #51740, Passport Applications, January 2, 1906 - March 31, 1925, 1653, NARA microfilm publications M1490 and M1372 (Washington D.C.: National Archives and Records Administration, n.d.); FHL microfilm 1,674,016. "Massachusetts State Census, 1865," database with images, FamilySearch (https://familysearch.org/ark:/61903/1:1:MQHC-H21 : 15 November 2014), David H Mckinney, Boston, Ward 10, Suffolk, Massachusetts; State Archives, Boston; FHL microfilm 954,377. "Maine Vital Records, 1670-1921", database with images, FamilySearch (https://familysearch.org/ark:/61903/1:1:2HVK-LYX : 27 December 2014), Wm Henry H Mckenney, 1844. "Maine, Vital Records, 1670-1907 ," index and images, FamilySearch (https://familysearch.org/pal:/MM9.1.1/KC81-9VR : accessed 03 Dec 2012), Allen T Hale in entry for Lillian Mccormick, 1907. "Massachusetts, Marriages, 1695-1910," index, FamilySearch (https://familysearch.org/pal:/MM9.1.1/FC8H-2QX : accessed 28 Nov 2012), Eugene C. Page and Celia J. Mclane, 12 Aug 1893; citing reference , FHL microfilm 745569. "Massachusetts, Marriages, 1695-1910," index, FamilySearch (https://familysearch.org/pal:/MM9.1.1/FHS2-RZN : accessed 28 Nov 2012), Eugene C. Page and Celia J. Mclane, 12 Aug 1893; citing reference 123, FHL microfilm 745569. "Massachusetts, Marriages, 1841-1915," index and images, FamilySearch (https://familysearch.org/pal:/MM9.1.1/N4HM-YL4 : accessed 28 Nov 2012), Eugene Carroll Page and Edith May Carey, 1903.
living at 322 Howard Street, Cambridge, Massachusetts. "United States Census, 1900," database with images, FamilySearch (https://familysearch.org/pal:/MM9.3.1/TH-267-11096-169774-29?cc=1325221 : accessed 28 April 2016), Massachusetts > Norfolk > ED 1067 Quincy city Ward 5 > image 26 of 33; citing NARA microfilm publication T623 (Washington, D.C.: National Archives and Records Administration, n.d.). 1880 United States. Census Office. 10th census, 1880 federal population census, Washington, District of Columbia: National Archives and Records Service, ([19--]) , Census Place: Cambridge, Middlesex, Massachusetts; Roll 543; Family History Film: 1254543; Page: 41D; Enumeration District: 435; Image: 0488. William Richard Cutter, Historic Homes and Places and Genealogical and Personal Memoirs Relating to the Families of Middlesex County, Massachusetts, Vol. 3, , at https://books.google.com/books?id=b6AhB-PTzMYC . New York: Lewis Historical Publishing Company, (1908) , p. 911. Massachusetts Births and Christenings, 1639-1915, , Indexing Project (Batch) Number: I01696-7, System Origin: Massachusetts-EASy, Source Film Number: 2108895, Reference Number: 64. 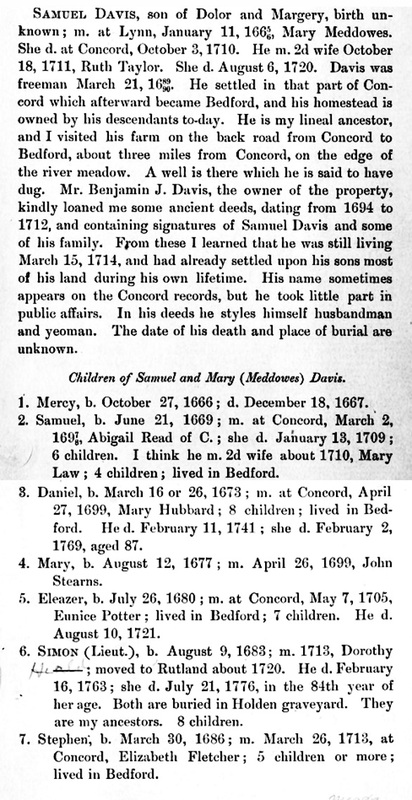 "Massachusetts Births and Christenings, 1639-1915," database, FamilySearch (https://familysearch.org/ark:/61903/1:1:FHDZ-4M6 : accessed 28 April 2016), Oliver Mead, 22 Nov 1874; citing Cambridge, Middlesex, Massachusetts, 28; FHL microfilm 2,108,895. 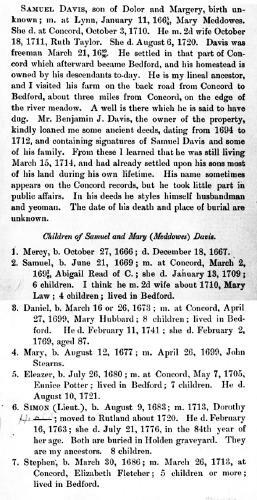 "New Hampshire, Death Records, 1654-1947," index and images, FamilySearch (https://familysearch.org/pal:/MM9.1.1/FS2W-75M : accessed 21 Oct 2012), Mary P Gould, 06 Feb 1888. Mary Meadows was born perhaps about 1641. William Richard Cutter, Genealogical and family history of western New York: a record of the achievements of her people in the making of a commonwealth and the building of a nation, Lewis Historical Publishing Co., (1912) , vol. 3, p. 1063. Horace Davis, Dolor Davis: a sketch of his life with a record of his earlier descendants, , at https://archive.org/stream/dolordavissketch00davi . Cambridge: The Riverside Press, (1881) , p. 40-41. Concord, Massachusetts Births, Marriages, and Deaths 1635-1850, , at https://books.google.com/books?id=vs8UAAAAYAAJ . Boston: Beacon Press, ([1891?]) , p. 76. "United States Census, 1930," database with images, FamilySearch (https://familysearch.org/pal:/MM9.3.1/TH-1951-22787-15886-19?cc=1810731 : 8 December 2015), New York > Steuben > Bath > ED 7 > image 22 of 26; citing NARA microfilm publication T626 (Washington D.C.: National Archives and Records Administration, 2002). Boston, Mass. : Globe Newspaper Company, , Date: February 24, 2005. 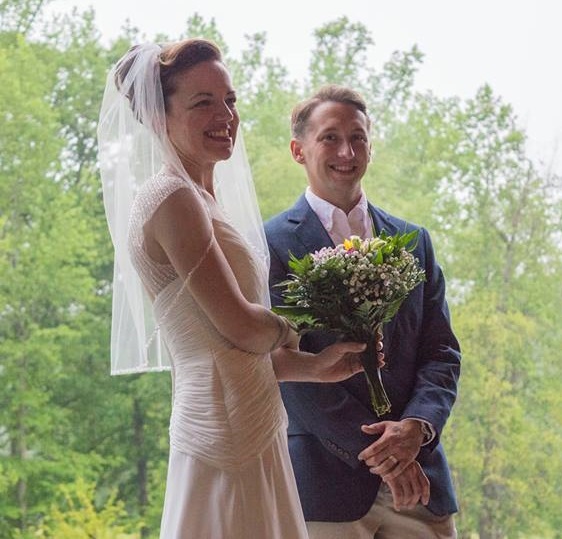 Joseph married Frances Gertrude Merrill, daughter of Wesley Scott Merrill.